He is a known loner, a man of serious conviction and fierce loyalty. People either like him or don’t, but that doesn’t bother him at all. He’s a realist and knows that the only control he has in life is control of himself. There is no pretense, you get what you see, you see what you get, and he’ll always tell you like it is. People in Yarnell know him as the tech/sound man for Denise’s music. But he has a much more intricate personality than that…..He is Lou Roggio. Lou was born 2nd Generation Sicilian as Louis Roggio, to grandparents who entered America through Ellis Island. His birthplace was Philadelphia, PA, where he resided the first 14 years of his young life. He “fondly” refers to his birthplace as “Filth-a-delphia, the City of Brotherly Shove”. Anyone who talks to Lou about his childhood on the East coast will find out very quickly that he is NOT a fan of crowded eastern cities. The urge to travel overtook him at a young age; he wanted to see the United States, and as he recounts it, he travelled throughout the states by use of his hitch-hiking thumb – not always a good experience, but often the way he could afford to travel. His wandering spirit led him to live in California, Arkansas, Oregon, Georgia, Florida, Colorado, and West Virginia, just to name a few of his adventures in life. Adventure and Freedom are Lou’s two favorite words, and not necessarily in that order. When I asked him if he has an accomplishment that makes him proud, he explained that “pride is a hard thing, but I am happy that I have been able to maintain a sense of freedom left over from the old pioneers.” Lou values freedom, and values the freedoms provided in the U.S. Constitution; he becomes angered when reading the news every morning, as he watches more and more freedoms being challenged and removed in our country…he is helpless to stop it. His loyalty for Constitutional rights for all Americans was the driving force for Lou’s voluntary enlistment into the U.S. Army in September of 1964, at the age of 17. His basic training was in Fort Jackson, SC, after which he was trained for Nike-Herc Missiles in Fort Belvar, VA for 8 weeks. His travels abroad began when he was stationed in Germany, where he trained at a Hawk Missile Battery. Then, as fate would have it, Charles de Gaulle withdrew France out of NATO, which meant that U.S. soldiers on French military bases were given seniority for positions. Lou was forced out of the Hawk Missile Battery and received his orders for Vietnam. Lou doesn’t talk about his experiences in Vietnam much; war is war, peace is peace, and a soldier did what was required to protect and defend – that’s that. He will, however, share the horrible experience of returning from Vietnam after finishing his duty in 1967. “Our own citizens spit on us, as though we betrayed them…” At a young age, Lou had realized how to recognize a true person of loyalty, and someone who is, well…FULL of it. All these experiences made him appreciate freedom and adventure even more. Lou’s marriage to Denise is his third (third time’s a CHARM!). He had a brief marriage at a young age after Vietnam. His second marriage lasted for over 20 years, and as Lou states, “We grew apart.” He fathered 2 children that were born 20 years apart: Robin who works for the University of Arkansas, and Louis (not a junior) who is on active duty in the U.S. Army; Louis is married and stationed in Fort Irwin, CA. Lou often pokes a little fun that his daughter, Robin, and his wife, Denise, are only a couple years apart! Congress, Arizona was Lou’s home prior to meeting Denise. Here’s the story in his own words: “I went back to New Jersey [from Congress] on a 2-week vacation to visit my brother, and I met this lady [yours truly] in parking lot….it took me 18 months to get back home!” Ahhh, what a romance…He added “I have a loving wife that puts up with all my idiosyncrasies.” Oh, well, we all have them. The entrepreneurial spirit in Lou has been alive and well for as long as he can remember. Over 40 years ago, having an interest in silver and Turquoise, he purchased a book called “How to Make Indian Jewelry”, and that’s when his silversmithing hobby began. Lou prefers to fabricate silver designs, not cast them. The difference is that casting uses wax as the fabricating material, a mold is made, and silver is melted down, poured into the mold, cooled, etc…However, fabricating is the twisting, hammering and bending of silver wire to form his designs; he doesn’t draw them out on paper first, but he creates them as he goes along. He enjoys the individuality of his pieces, and though some are similar, NONE are identical. He could have them mass produced, but that would defeat the purpose of his handcrafting – one unique piece for one unique person. Lou’s workspace is small, and he always says he doesn’t need much. But one thing he does need is wide open spaces, such as here in Arizona. 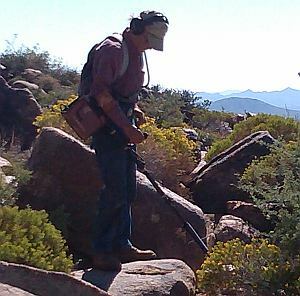 Gold Prospecting and Metal detecting became a favorite hobby over 20 years ago. The happy owner of a Minelab GPX 5000 metal detector, a dry washer and a wet washer, Lou enjoys the outdoor sunshine, the hiking and general HUNT. Over the years he has found quite a bit of gold, some of which he has sold, and some he has saved. Gold prospecting is what bonded him with two men that he has maintained good friendships with over many years: Bill Southern, who resides in Morristown, AZ and Bob Mote, who resides in Oregon, and comes to Arizona to prospect every winter. If you are reading this and have an interest in learning the ropes of prospecting (or if you want to meet like-minded people) Lou suggests that you go to http://www.nuggetshooter.com/. His aforementioned friend, Bill Southern, runs the website and is a great resource for prospecting and detector information. Another hobby Lou developed – one that fit him like a glove – is the realm of computers, and he enjoys everything from Internet to tekkie subjects. He didn’t acquire his first computer until the age of 50, but it was meant to be. Some of the things he quickly learned to accomplish were: building and maintaining web sites (he is the webmaster for the American Legion Post 79 in Yarnell as well as for Denise Roggio and Roggio Music and Argento de Roggio), and how to record albums/CD’s. Lou is the recording producer for Denise’s “Ash ‘N Blues” and “Light My Path”. He has fixed numerous computers, and upgraded lots of software. Jewelry making has been his focus for the last several weeks. 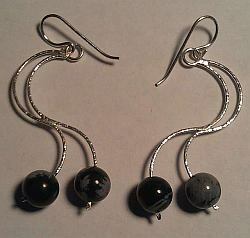 Lou has managed to fabricate almost 3 dozen pairs of genuine 925 silver sterling earrings, some with moonstone, turquoise, moss agate, black onyx, and/or mother of pearl accents. He and Denise work on the website together regularly, getting the information out to facebook and twitter fans, and propagating through the good old way of advertising: word of mouth. 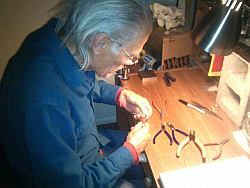 To contact Lou and purchase his exquisite jewelry designs, visit: Argento De Roggio. I enjoyed Lou’s story very much. 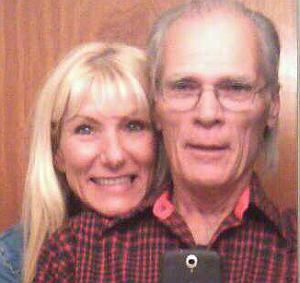 We are so glad you two found Yarnell. I really love my earrings too Lou and find them so light and comfortable to wear. I love to share them with others and let them know who made these beauties. Thanks for sharing your music and friendship! Barb, you’re such a genuinely wonderful lady! You wear those earrings well, too! Walt and I consider Lou and you friends of ours. We enjoy talking and visiting with you guys when we can. Lou is a man of many talents. I am proud and delighted to have one of Lou’s earring creations and look forward to seeing more of his one of a kind designs. Dolores, thanks for the comment. We are glad to be called friends, and that sentiment is mutual. Your dear husband picked those earrings out for you when he visited us one morning. So happy you like them. We will have a get together again very soon! Louis – hard to call you that :) so you’ll always be Lou to me. You and Denise have found a home here in Yarnell and we love you both and you cannot ever leave. We’re glad you made the visit to Jersey and came back with a wife. I love, love, love my earrings that you made. They are gorgeous. Sounds like the “Hotel California”, we could check out, but NEVER leave!! So funny, and you’re so very sweet. We will all miss you when you’re away for a few weeks, but if two people on the planet EVER needed a vacation, it’s you and Chuck. Lou says he’s glad you like them, and appreciates how you spread the word, not just for earrings, but for music, and for events, and for – you always spread the word! It’s a great gift you have to bring people together and promote things you know they’ll enjoy. Thanks, dear friend, love ya much! Thanks Denise. It’s great getting to know you both and I hope to see you Friday evening with questions for Lou about metal detectors. I’m also one who needs to see what’s over the next hill. Thanks for commenting, Pastor Paul! We had no idea that’s a hobby of yours. Lou sent you a private email regarding detecting; hope you received it and are feeling better. We were told the dreaded bug chased you down. Blessings, and thanks again.